The Multipack Chicken Selection Pots contain three different kind of meals with chicken breast fillet for your cat. Each dish is packed with tender and lean chicken meat. The potion packs are supplemented with duck meat, rice or tuna. This combination makes a tasty meal for your cat. One pack contains 8 60-gram pots. The convenient portion packs allow you to serve your cat a tasty meal every day. 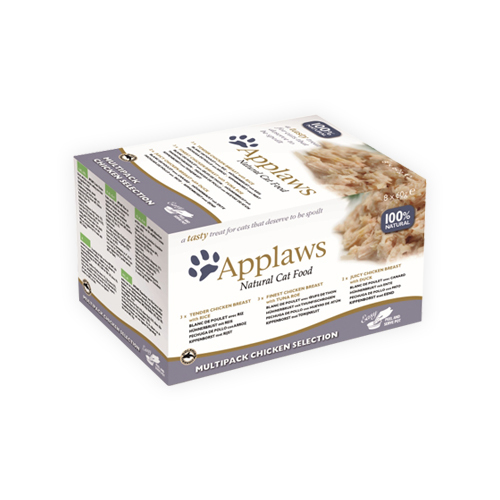 The Applaws Multipack contains three different flavours: Chicken Breast & Duck, Chicken Breast & Rice and Chicken Breast & Tuna Roe. Each dish is packed with tender and low-carb chicken meat and is supplemented with tuna roe, duck or rice. The food is packed in convenient pots. You do not need a plate to serve this food. Each portion is a natural source of taurine. This nutrient supports the condition of the eyes and is beneficial for the heart. Chicken Breast & Duck: Chicken breast (55%), chicken broth (35%), duck (5%), rice (5%). Chicken Breast & Rice: Chicken breast (60%), chicken broth (35%), rice (5%). Chicken Breast & Tuna Roe: Chicken breast (54%), tuna roe (6%), chicken broth (35%), rice (5%). Have you used Applaws Cat Food -Multipack Chicken Selection Pots before? Let us know what you think about this product.